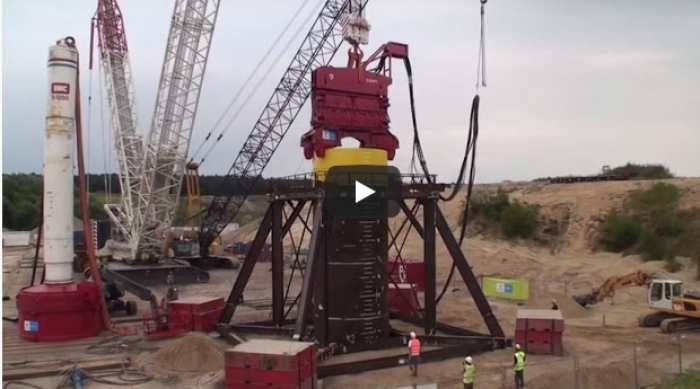 The PVE 500M vibratory hammer has been trialled against high speed double-acting impact hammers as traditionally used on large monopiles for marine-based Wind Farm Projects. The monopiles were 4.300m diameter x 42mm wall thickness x 21.0m long, weighing 94.0-tonnes. The PVE 500M was able to drive these piles through the soil material with high water table in only 3 minutes. By contract, the traditionally used high speed double-acting impact hammer required 30 minutes !!! (See video on attached link). The PVE 500M vibratory hammer supplied by DIESEKO / Pilequip, is more efficient, offering huge savings in time (and hence, huge savings in cost) in Wind Farm pile driving. For any enquiries, please contact Brett Camm, Managing Director at Pilequip.